Holy Smoke! Get it, get it, get it! These 16 remastered episodes are prime examples of why The Goodies ruled and in many ways still do. Their brand of humour has not been replicated by anyone in the same way since despite many attempt to do so and chances are will never be. Starring Bill Oddie, Tim Brooke-Taylor and Graeme Garden you just know that you are in for a treat when this set comes jam packed with 6 episodes of The Goodies by the three stars of the show that really gives some fabulous insight into the series, how they felt at the time and gives you an idea of how it’s all coming along today. 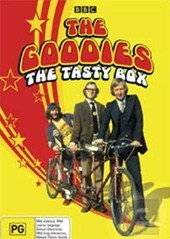 The contents of this disc are what have previously been released as The Goodies Volume 1 and The Goodies – A Tasty Second Helping so if you already own them then you might want to rethink the process for yourself before laying out the cash. It’s funny as a lot of humour ages very quickly nowadays with things moving so fast in the techno age but the humour found on this disc is still just as good now as then. I didn’t find at any stage something that I could no longer find hilarious due to age of jokes. Of course the guys look very silly but hey, they just look silly! For me, Ecky Thump says it all. This was a show that literally had me screaming with laughter all the way through, whether it was the way they said it, the actions or just everything, I don’t know but I loved it! For those who don’t know what Ecky Thump is, it’s a martial arts craze that involves hitting people with black pudding which looks like a long black sausage! It has to be seen to be believed. Restoration Featurette detailing the process that brought The Goodies into the 21st century!